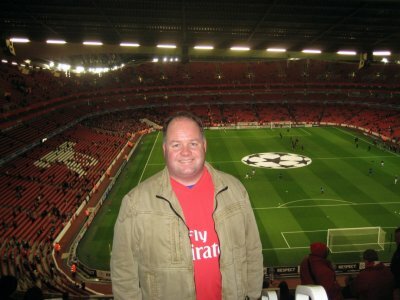 Gregwtravels to the Emirates Stadium on November 4, 2009 to see a match between Arsenal and AZ Alkmaar in the UEFA Champions League group matches. Arsenal won 4-1, giving them 10 points in 4 games and an almost guaranteed entry to the next round. In the early 1950s, English football team Wolverhampton Wanderers did a tour of Europe playing “friendly” matches. A friendly is a game played between two sides that doesn’t have any league or title consequences. These games are often played in the off season so teams can stay sharp. The Wolverhampton team (“The Wolves”), one of the best teams in England at the time, beat a number of the top European clubs. The British Press started calling the Wolves “the Champions of the World” due to this success across the channel on the continent. This didn’t go down too well with teams and fans over in Europe, so in 1955 the European Champion Clubs’ Cup tournament was started. At first only one team from each country was invited in (the winner of the national league competition), but in 1990s, the format was extended to include teams who are runners up, depending on how “good” the league they come from is deemed. At present, the England’s top four teams from the Premier League enter the Champions League (or more properly the UEFA Champions League), the most from any country (tied with Italy and Spain, who also send 4 teams). The 32 teams are divided into 8 groups of 4 teams each. The teams then play each other twice, one home game and one away game. The top two teams from the group stages move on to the knock-out stage. For the round-of-16, quarter finals and semi-finals, the teams play two games (one home and one away), and the winner is the one with the highest aggregate score. If there is a tie in the scores, away goals count more than home goals. The final two standing teams play one game at a pre-determined site to declare the winner. Last tournament in May of 2009, the final was played in Rome. This tournament, Madrid hosts the final on the 22nd of May, 2010. Right now, the UEFA Champions League is in the group stages. 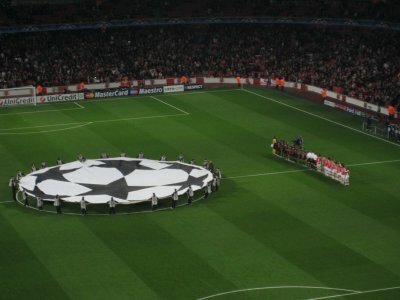 One of the four English teams playing in the Champions league this year is The Arsenal. 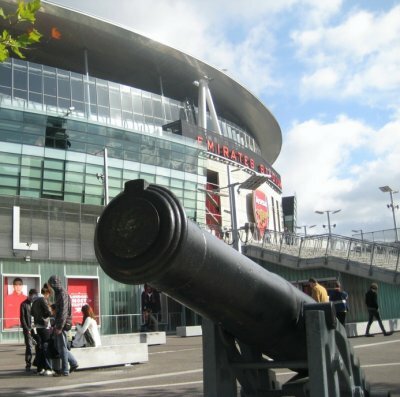 Arsenal’s history dates back to the 1886, when a group of coworkers at the Dial Square workshop of the Royal Arsenal in Woolwich decided to form a football club. Calling themselves the Dial Square football club, the boys played their first match against The Eastern Wanderers on December 11, 1886 on the Isle of Dogs (where I used to live). It was a 6 - 0 win, over a club which I can find no more information about other than they lost one game to a team that would become one of the top teams in England. Despite the similarity in name Wanderers, they were not the same club that kicked off the Champions league back in the 1950s. The Dial Square football club changed their name soon after to be known as Royal Arsenal. 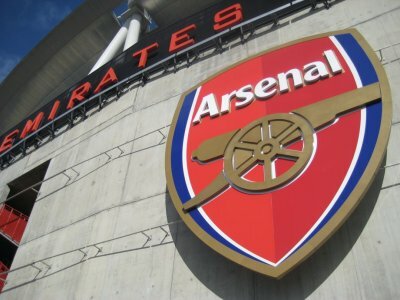 The club remained an amateur side for the workers at the Arsenal until 1891, when they turned professional and changed their name again, this time to Woolwich Arsenal. 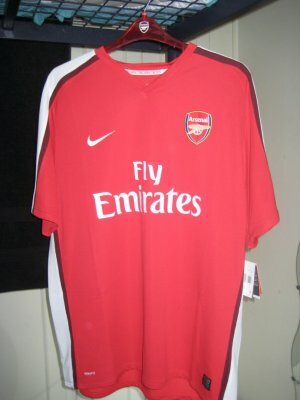 They joined the Football League, a collection of mostly northern based professional teams in 1893. However, the Woolwich team didn’t do well against the more established northern teams, and soon found themselves floundering both competitively and financially. 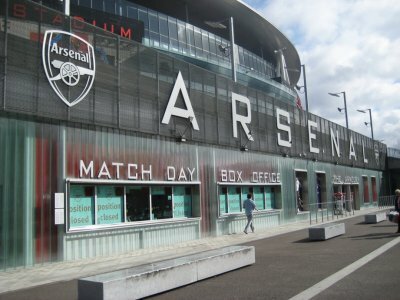 In 1913 the team moved from Southern London up to Islington (where I currently live), to a grounds in Highbury. They dropped the “Woolwich” from the name (for obvious reasons), and have since been known simply as The Arsenal, or The Gunners. As for me, I think I may becoming a fan of them as well. 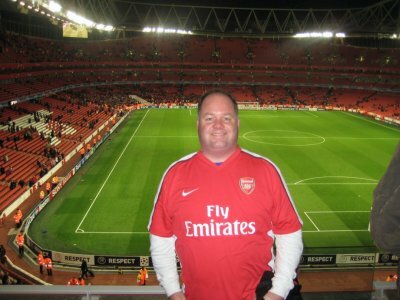 I wrote about the need to pick a football team to cheer for back before I moved over to England. I had talked about maybe Chelsea or Tottenham - both London based teams, but never committed to either. I flirted with the idea of cheering for West Ham or Millwall back when I lived on the Isle of Dogs due to their geographic proximity, but never connected. Arsenal though, I think is a team I can get behind. They have a fancy stadium (which happens to have a travel related sponsor even), are close to home and are one of the top teams in the league. I like that in team, after years of living in Toronto where we had the definitely not top of the league Toronto Maple Leafs. Plus, I’ve already bought a shirt. 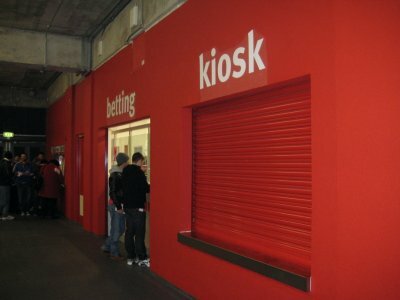 The Arsenal played at the ground at Highbury until 2006, when they moved to new, flasher digs just down the road. 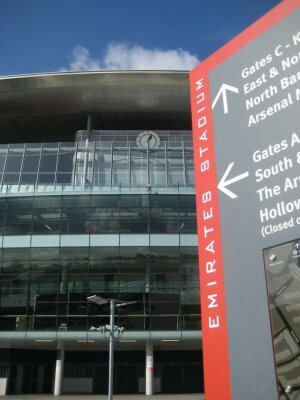 The new stadium was initially called Ashburton Grove, until a deal to sell the naming rights was secured with a middle-Eastern based airline. 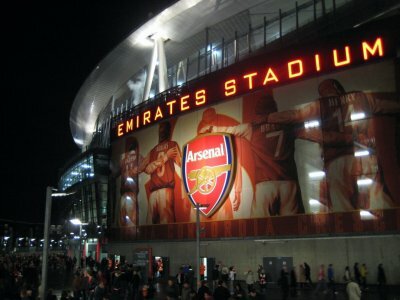 The stadium is now known as The Emirates. 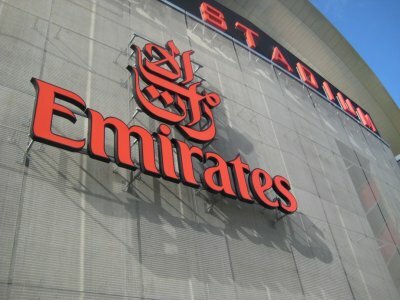 The Emirates is just up the street from my flat, a 30 minute walk or a 2 stop tube ride. The stadium holds over 60,000 fans for football matches (including over 7,000 seats in the high priced “club level”), and is often sold out. 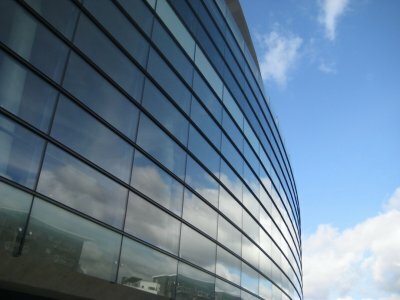 On the outside, the stadium has a number of large glass covered areas which reflect the blue sky during day games and show off the fancy club level restaurants and bars at night. Arsenal, after finishing fourth in the Premiership, qualified to be in the Champions League tournament. They are in group H along with Olympiacos from Greece, Standard Liège from Belgium and AZ Alkmaar from the Netherlands. After three games, Arsenal are atop the group with two wins and a draw. Their last game was against AZ Alkmaar in The Netherlands, where they drew 1-1. 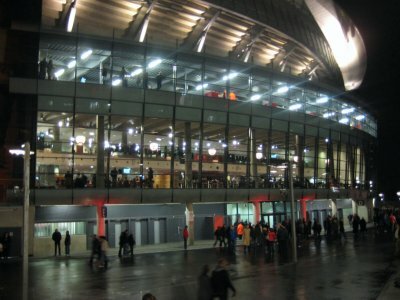 The match on the fourth of November, 2009 at the Emirates was a chance for Arsenal to get revenge on AZ after the draw, which Arsenal thought they should have won. A win would also keep them comfortably atop Group H.
For Champions League games there are a few changes at the Emirates. Firstly, it’s not called The Emirates. 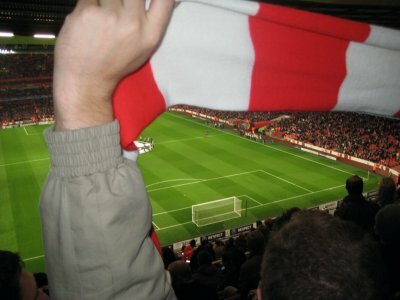 Due to conflicting sponsorship between the clubs and UEFA, stadiums are not referred to by their “naming rights” names. 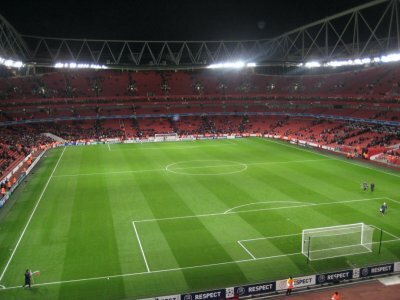 Arsenal’s ground is called “Arsenal Stadium” on Champions League game nights. Also, they don’t sell beer. You can bet, though. I had nice seats in the upper tier behind the north end goal. Despite being in the upper deck, the view of the field was still very good, and it wasn’t a problem to follow the action at all. The fans were on fine form, chanting and singing throughout the match. “We love you Arsenal” was sung every four minutes or so. After the first goal, the faithful started singing “One-nil to The Arsenal” to the tune of “Go West” by the Village People. After the third goal, putting Arsenal up 3-0, the fans started a chant of “Are you Tottenham in disguise,” referencing Arsenal’s 3-0 win last weekend over hated cross-town rival Tottenham Hot Spur. One of the best chants was in honour of The Arsenal’s coach Arsène Wenger, where the fans sing “There’s only one Arsene Wenger” to the tune of Guantanamera. At least I already have the jersey.